New York Sports Clubs is a chain of gyms that operate around the country. We were tasked with giving the established brand well deserved tune-up. We worked on everything from the rebrand and in-gym design to redesigning their website from the ground up, we did it all – and I was there every step of the way. 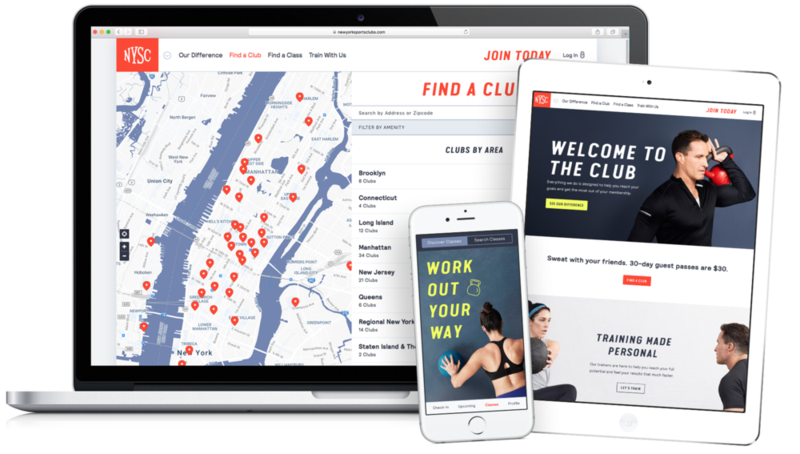 This project was particularly challenging because New York Sports Clubs is a well-established brand, and we wanted to create a brand that felt familiar and ready for the 21st century. My role in this project was to help lead the team in creating treatments & design systems that could be applied across all the different verticals. As product design lead, it was my responsibility to oversee and design in both the UX and UI phases. 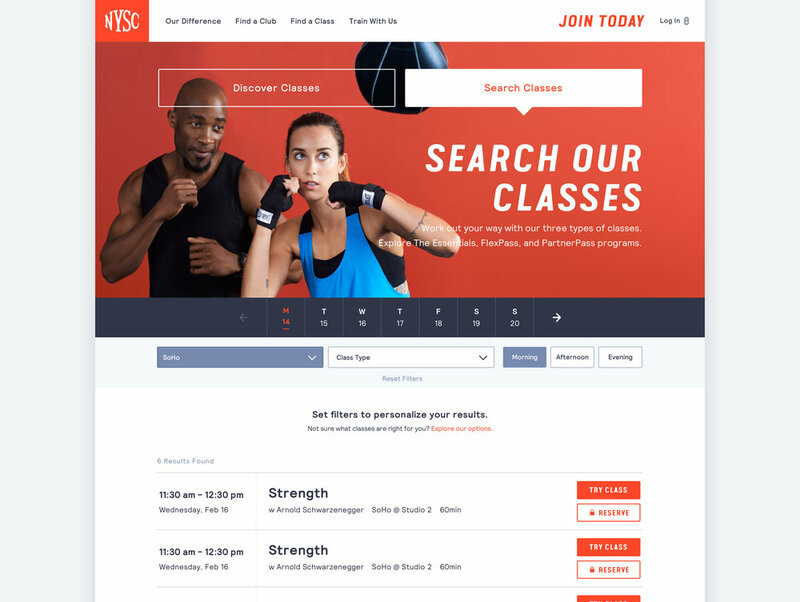 I worked closely with UX designers and programmers to redesign the NYSC website from the ground up. Our goal was to create a usable product in which prospective members could get a clear idea of everything NYSC has to offer and sign up, while also providing an excellent tool for existing members to book classes and purchase services such as training or baby sitting. The brand we developed relied heavily on photography and we wanted that to shine through on the website. We used photography to tell the story of the new NYSC. To do that, we had to carefully map out our photography to make sure the photos we captured would pair well with the design & typography of the site – and have a shoot. 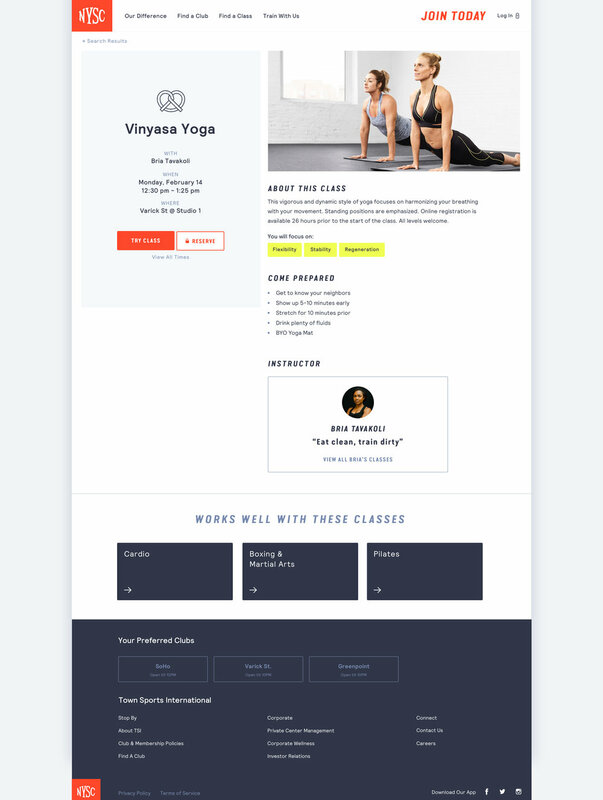 The tools we designed to find clubs and classes are robust, the challenge here was to make sure they felt modern, usable and not overwhelming. Throughout the site there are micro interactions designed to give the website some energy. My role in this portion of the project was to oversee the mobile designer, be a resource and make sure all UX and UI treatments were consistent with the brand at large.